The Flying Bat nebula, Sh2-129, is a large emission nebula in the constellation Cepheus. With an apparent diameter of over 2 1/2 degrees in our sky, this faint Ha region is often overlooked due to the proximity of its much brighter celestial neighbor, IC 1396. Above and to the right of Sh2-129 is the reflection nebula, vdB 140. While having no distinct features, the nebula is interesting because it appears to also be embedded within an HII region. The image contains several dark nebulae as well. Most notably, on the left side of the image is Barnard 150 - the Seahorse Nebula. The "star" of this image is the enigmatic object, the Squid Nebula - OU4. Discovered by Nicolas Outters only 2 years ago in June 2011, the Squid Nebula shines by the blue/green light of OIII - the forbidden line of doubly ionized Oxygen. Over a degree long, the object is extremely faint and even more mysterious in its origin. Originally believed to be a planetary nebula, astronomers have since concluded that it is not such an object. However, to date, it is unclear exactly what OU4 is! In this image, North is Down. This image is cropped to 88% of the original frame. Software Used Images Plus 5.75 Beta for camera control, calibration, stacking, and digital development. Images Plus 5.75 for feature mask, star masking, smoothing and noise reduction, and star shrinking. Photoshop CS5 used for levels and curves, hue/saturation colorizing, hue adjustments, lab color, vibrance, match color, selective color, high pass filter, and unsharp mask. Gradient Xterminator for gradient removal. Registar for registration and stack alignment. Carboni Tools for additional noise reduction and smoothing. Focus Magic for focus restoration. HLVG for additional color adjustment. OU4 is by far and away the faintest object I have ever tried to image. Despite spending 4 nights to capture over 20 hours of narrowband OIII data, the nebula was almost invisible in the data. Fortunately, Mike Unsold had just completed version 5.75 of Images Plus which includes his new "Feature Mask". This function allows me to remove the stars from an image so that I can concentrate on enhancing the faint parts of nebulae hidden in an image. This turned out to be the perfect scheme for bringing out OU4. While I don't think this is a great image of OU4, I am very pleased to have captured it at all. As it happens, I could only find 6 images of this object on the Internet, and all of them were captured with cooled CCD cameras. As a result, I am reasonably convinced that this astrophoto is the first image of OU4 that was captured using a "lowly" DSLR! 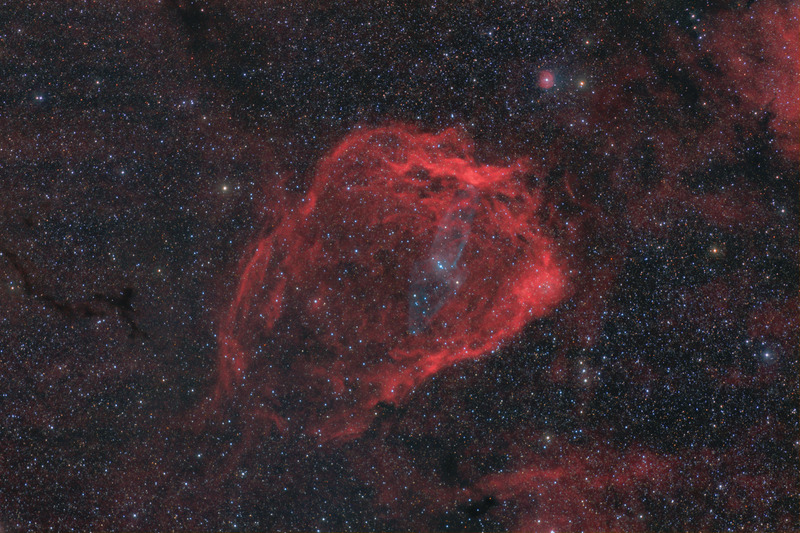 This image won first place in Astrophotogallery.org's Medium-Nebula category for November 2013.